This article intends to provide detailed, step-by-step instructions that’ll help you understand, how to set up ELEX WooCommerce Australia Post Shipping Plugin with Print Label & Tracking. Refer the product page to know more about other various features of the plugin. If you want to use StarTrack service, read our article on configuring the plugin with a StarTrack account. Australia Post provides postal services in Australia and its overseas territories. Australia Post is the trading name, Australian Postal Corporation (formerly the Australian Postal Commission) is the Australian Government-owned entity responsible for the service. Our WooCommerce Australia Post shipping plugin provides easy, seamless integration of WooCommerce with Australia Post services. In addition to accessing real-time shipping rates, the plugin also provides print label and shipment tracking facilities. How to print labels for Contracted accounts with ELEX WooCommerce Australia Post plugin? 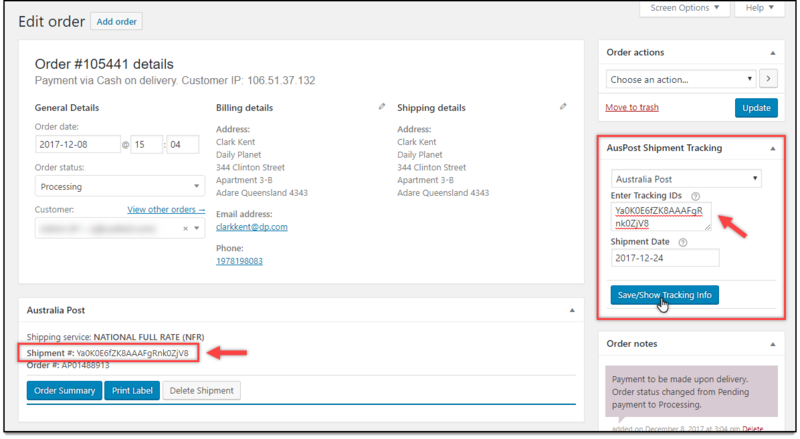 How to generate Order Summary Report/Manifest with ELEX WooCommerce Australia Post plugin? How to configure WooCommerce Australia Post Shipment Tracking? How to generate Australia Post shipping labels in bulk? How to print multiple Australia Post labels on a Sticker Sheet? Real-time shipping rates: Based on the shipping destination address, product weights, and dimensions, the plugin fetches real-time rates for both domestic and international services. Print shipment label: You can print shipping labels from order pages in the back-end of your WooCommerce store. Postage is automatically paid on the printed labels using your Australia Post account. Shipment Tracking: A barcode is added to the shipment label, with the help of which, the shipments can be tracked. All these features (and many more!) are bundled into one solution to serve your WooCommerce-Australia Post shipping integration needs for your online store. Account Details: Enter the API Key that you have received after registering for an Australia Post account. This key is applicable for both contracted and non-contracted rates. How to register for Australia Post? 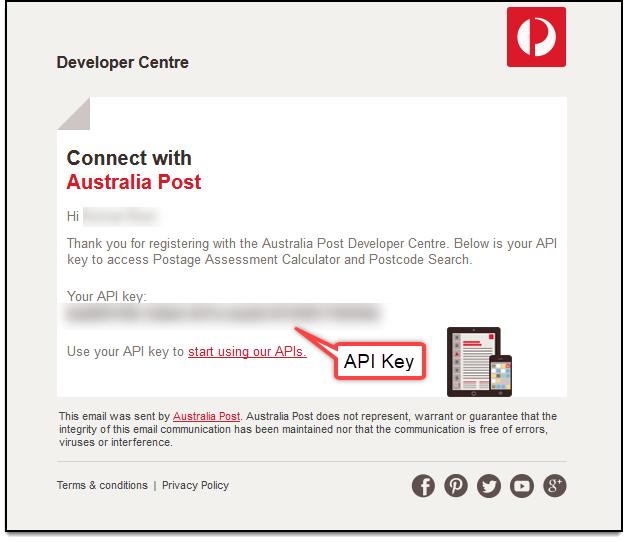 To obtain API key, register for Australia Post and obtain the key from this page. Follow the given procedure to receive your API key. After registration, you will also receive an email containing your API key. Screenshot of a sample email content is shown below. Remember, if you have registered for a general account, you can only access Australia Post real-time rates with our WooCommerce Australia Post plugin. If you wish to enable printing shipping label, shipment tracking, and box packing facilities, sign up for a contracted/business account. How to obtain Australia Post credentials? You can read our article to understand how to register for an Australia Post account, obtain credentials, and use them in our plugin. If you wish to avail Australia Post contracted rates for your WooCommerce store, enable the Contracted Account checkbox. Once enabled, further settings appear which allow you to switch between Test Mode and Live Mode. Enter your respective API Password and Australia Post account number in the given text-fields. Further, you can enable StarTrack services, by ticking the respective setting. Note: From version 2.3.6, you can use eParcel and StarTrack accounts together. You can access both the rates and services simultaneously. This article explains all the settings for eParcel services, for StarTrack, you can read the respective guide. Enable the real-time rates checkbox to access Australia Post real-time rates. If you are not getting proper rates ( lesser or higher than expected), not getting all the available shipping options, or not getting any rates at all, then you can tick the Enable Developer Mode checkbox to find the error(s). You can also see the warning(s) by our WooCommerce Australia Post Shipping plugin. By enabling debug mode, you can trace issue using log. You can see information about debugging at the top of the cart and checkout page. After enabling debug mode, add a product to cart. Go to cart or checkout page to see the debugging information. If you have enabled contracted rates, an additional setting titled generating shipping label will appear in this section. If you wish to enable shipping label generation, tick the Enable Shipping Label check box. Default Currency: Shows the default currency of Australia Post. Shipper Address: Enter shipper name, address (the address from where the items will be shipped), contact number and email address in the respective text-fields. 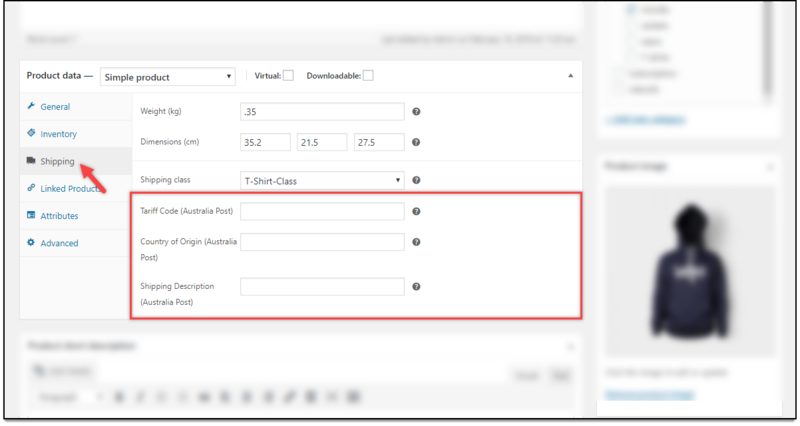 This tab contains settings for configuring Australia Post services and how they will be displayed on the front-end of your store. Show Cheapest Rate Only – This option shows services only with the cheapest quote from the selected Australia Post services in the Services section (discussed in the later part of this article). Disable Alternative Services – Tick this checkbox if you not offering services like Satchel, Letter, C5, B4, DLE, and such other services during checkout. For example, you cannot use a satchel when all the items in your store are fragile. Therefore, all items need to be sent in a box. 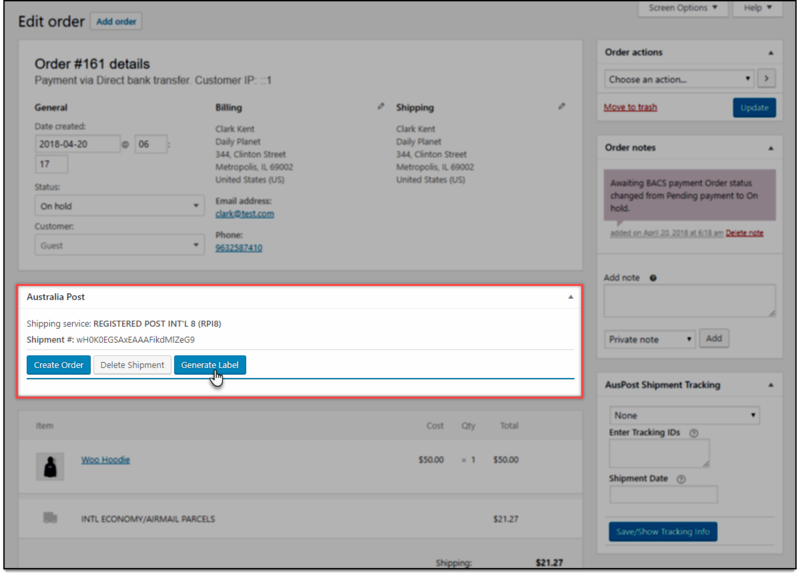 Enable Checkout fields: These options will be available to the customers on the checkout page. 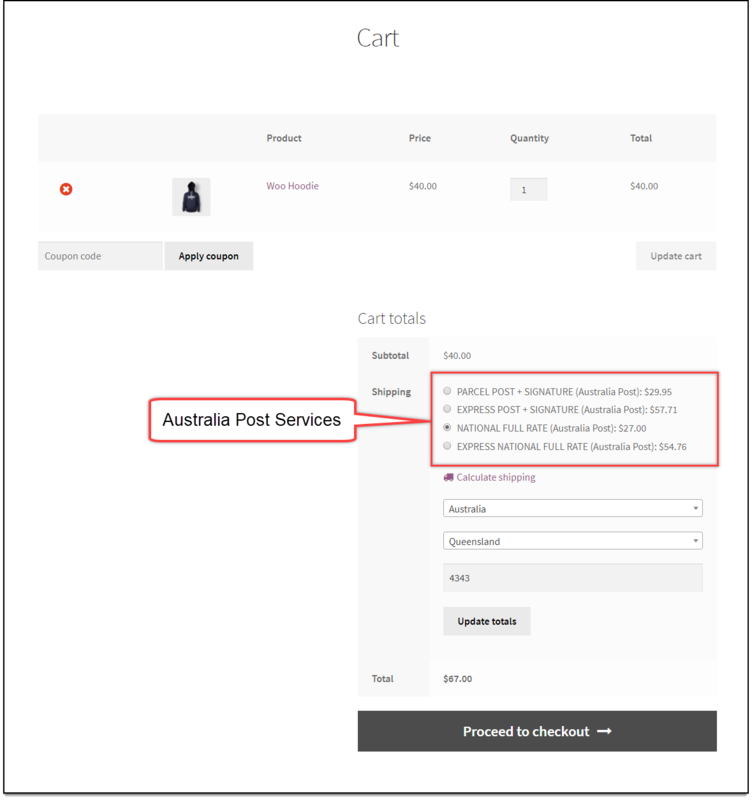 Our WooCommerce Australia Post Shipping plugin supports the following domestic and international services. You can enable/disable desired services. The first column represents all service names. In the second column, you can select the desired services by ticking the respective Enable checkbox. Non-selected services are not shown to the customer, even though they are available services from Australia Post. You can set a custom service name in the third column titled, Name. Tick the Extra Cover checkbox for additional insurance of goods, if you are sending some valuable or important items. The extra cover provides cover for a specified value of your item if the item is lost or damaged while being carried by Australia Post. For more information, see the Extra Cover option. Tick the Signature/Registered checkbox to get a signature from the customer receiving the package, at the time of delivery. The last two columns are used for price adjustments. You can add or subtract the required amount to/fro actual shipping cost. Use minus sign (-) for subtracting the amount. You can specify the price by a percentage or amount value. For example, consider shipping cost of Regular/Parcel Post returned by Australia Post is $5. Total cost displayed Regular Post is $10($5+$5). Total cost displayed Regular Post is $5.5(The 10% of 5 is added to 5 + 5 to get the actual). Total cost displayed Regular Post is $10.5 (The 10% of 5 is added to 5 + 5 to get actual). The label and tracking settings are as shown below. Show Australia Post Logo on the Shipment labels: Enable this setting to show the Australia Post logo on the shipment labels. Customer Address Type: Choose one of the following options to specify the type of customers’ address. Normal Delivery Address – For customers with general house address. Australia Post Parcel Locker – For customers who opt for parcel locker facility. Australia Post Parcel Collection location – For customers who choose desired Australia Post pickup location to collect their parcel. Bulk Shipment: Choose the default domestic and international service for bulk generation of domestic and international shipment label respectively. This label generation is processed in WooCommerce Orders page. If there are no shipping services defined for an order, the default services defined in these settings will be taken into consideration. Documents Output Type: Shows the default output format for printing documents, that is PDF. Documents Layout: Choose from the following desired layouts for printing the label. Weight/Dimension Unit: Shows the default weight and dimension unit, that is KG/CM. Note: The above two settings are defaults in Australia Post. You cannot change to other format or unit in the plugin settings. Shipment Content: You can provide a description of the shipping contents. This description will be printed on all the printed documents and is usually required for security checks and customs. Custom Shipment Message: The plugin provides flexibility to customize shipment tracking message. This message will appear in email, WooCommerce Admin order page, and Customer’s Orders section (under the My-Account page). Your order was shipped on 2018-01-01 via Australia Post. To track the shipment, please follow the link of shipment IDs EN428785455IN, EN428785456IN. You can get real-time rates for items using API. With price calculator, you get real-time postage rates for domestic, as well as international shipping. Real-time rates are calculated based on product dimensions and weight, and the best-fitted box rates are returned from Australia Post. This rates will depend on the method used for packing the parcel. Our WooCommerce Australia Post plugin offers three types of parcel packing methods. In this option, each item in the cart is packed separately. Total shipping cost is calculated by adding the shipping cost of each item. This option is selected by default. If packing items individually does not suit your business, then you can define custom box sizes under Box Dimensions section. All the cart items are packed into custom boxes defined in Box Dimensions settings. The best fit box is automatically chosen from the defined boxes. This is the recommended option and is available only for Contracted accounts. You can read through setting up box dimensions to understand box packing in detail. For example, consider you have product X of dimensions 9 x 5 x 2 and weight 10 lbs. You can set up boxes as shown in the below screenshot. If there is one unit of product X in the cart, then Box1 is selected for packing. If there are two units of product X in the cart, the Box2 is selected. If there are four units of product X in the cart, then Box3 is selected. Likewise, you need to define inner and outer sizes for each logical box, according to the packing style being followed for different products with different quantity. Enable the box sizes you want to use for packaging. The settings are as shown in the screenshot below. Enter the maximum weight limit for packages. In this option, the weight of all the cart item is summed up and items are packed with maximum weight limit in the box(es) and passed to API to get rates. Different products might need a different level of processing. If you are shipping globally, you must enter the following details for every product. 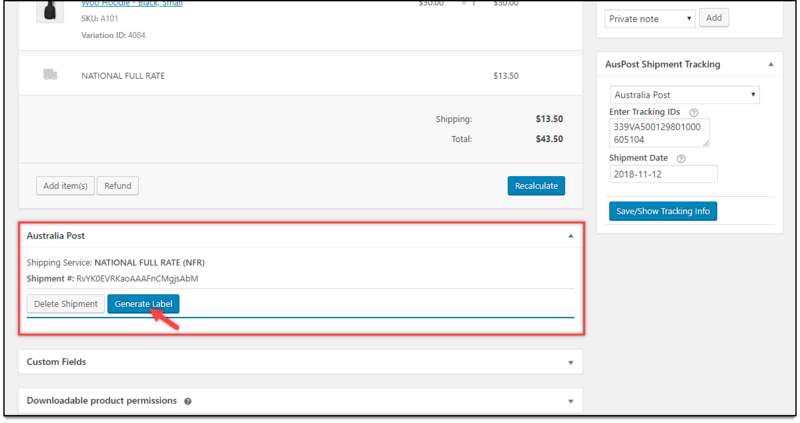 These settings can be found in the Shipping section of WooCommerce Product Data meta-box of each product. Tariff Code (Australia Post): HS is an international standardized system of names and numbers to classify products. Shop owners can provide the HS number of the product so that international shipments are processed smoothly. Country of Origin (Australia Post): Enter the country of origin. Shipping Description (Australia Post): A description that will be printed on the commercial invoice. This setting is available in individual product settings. If you are shipping dangerous goods, you can enable this setting and select the required category of dangerous good. 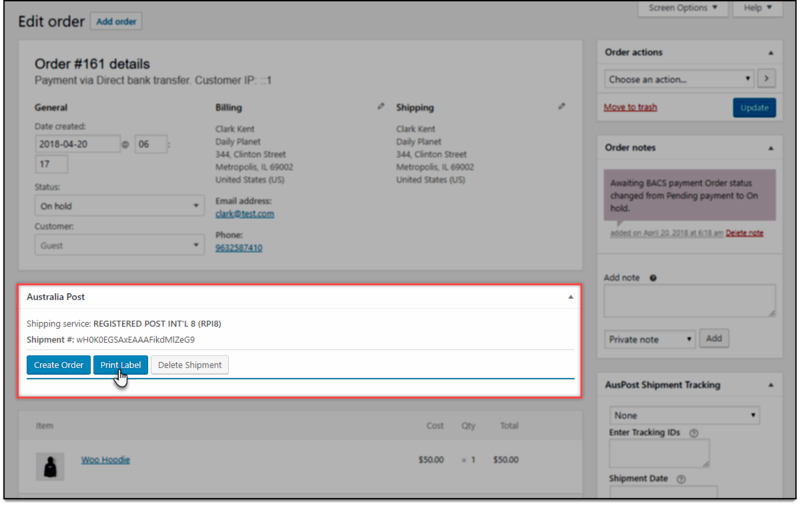 To access this setting, open a product page to edit, move to the product data meta-box, and go to the Shipping section. Read more on Dangerous and prohibited goods and packaging guide. How to print labels for Contracted accounts with WooCommerce Address Post plugin? Once you have enabled Contracted Rates option, in addition to getting contracted rates for your Australia Post account, you can generate shipping labels as well. Open an order to view order details. 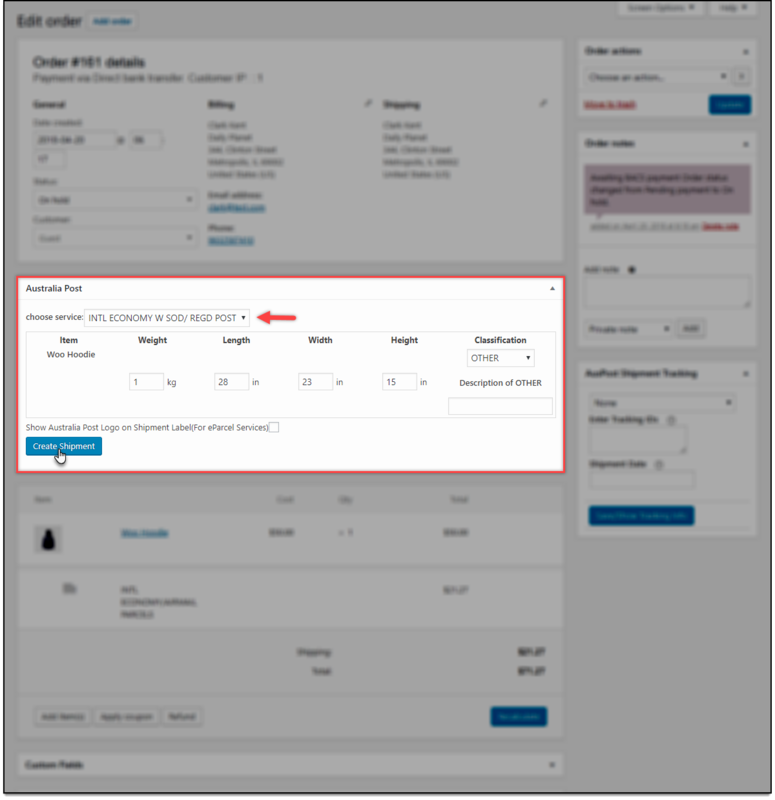 The Create Shipment option for the order is displayed as shown below. The shipment information includes the item name and its respective weight and dimension. The plugin allows you to change the shipping service and an option to show/hide Australia Post logo on the shipping label. For international shipments, an additional setting is provided where you need to specify the product classification. This information is mandatory for sending packages outside Australia. 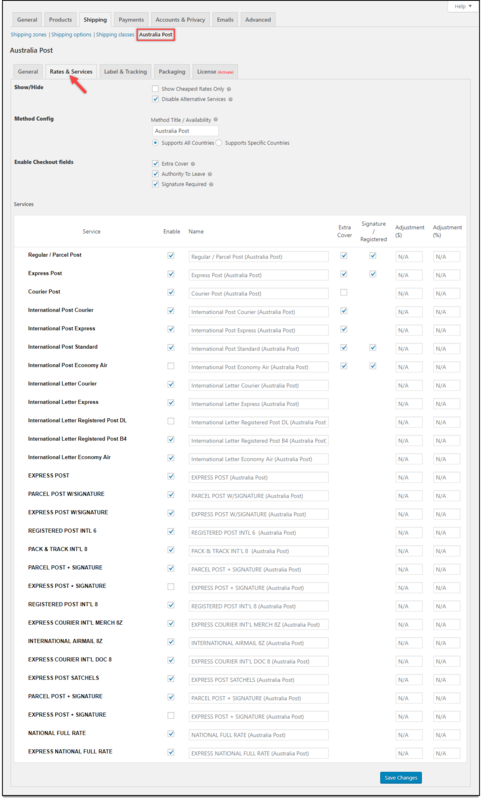 Following is a screenshot of the options available for product classification. If you select the GIFT, SAMPLE, DOCUMENT or RETURN option, the commercial charges(or customs) will not be charged. If you have selected the OTHER option, the shipment will be treated as commercial and will be charged accordingly. To create a shipment, Click the Create Shipment button. Next, the shipping service ID and shipment number will be generated as shown in the screenshot below. Click the Generate Label button to proceed. Print label option appears as shown in below screenshot. 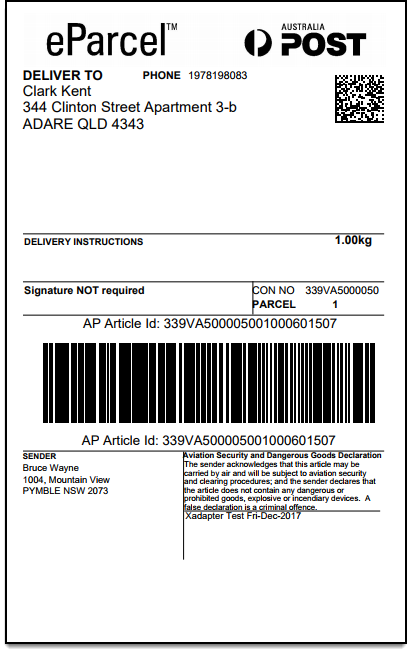 A screenshot of sample Australia Post domestic shipment label is shown below. International shipping document contains four labels – One to attach to the item, one Australia Post copy, one Customs copy and one for Sender. A sample international shipping label is as shown below. 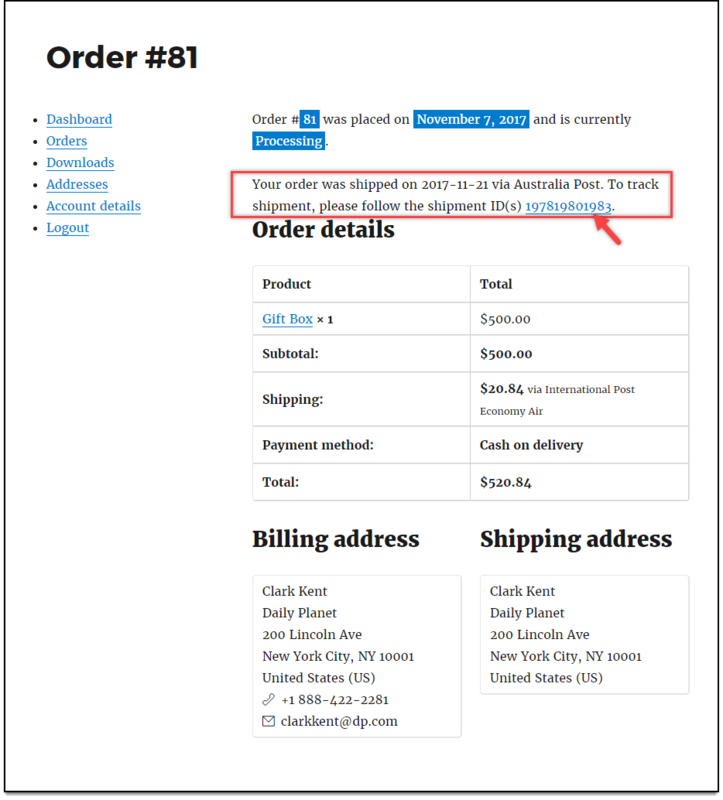 How to generate Order Summary/Manifest with ELEX WooCommerce Australia Post plugin? 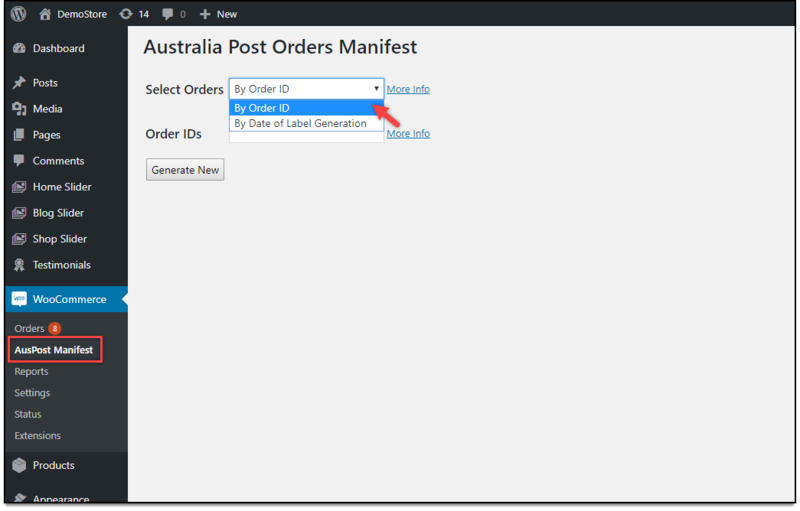 The plugin offers a separate dashboard to generate and print the Australia Post Order Manifest. This differentiation is to help you download/print multiple order manifests at once. You can access these settings from WooCommerce > AusPost Manifest. But before you generate Australia Post Order Manifests, you need to create shipments and also generate labels for the orders. 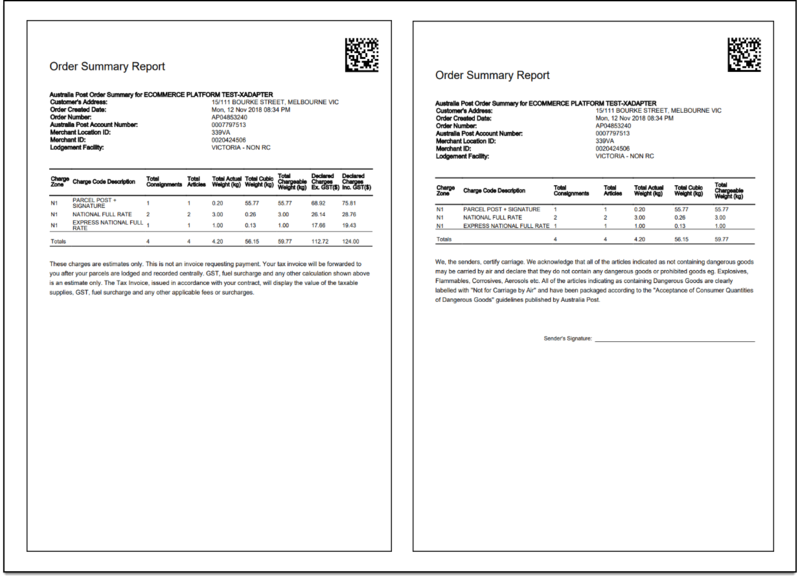 In the earlier section of this article, you saw how to create a shipment for printing labels. If you want to generate a single order manifest, you can follow the same procedure for creating a shipment as explained for printing labels. If you want to generate multiple order manifests, you should create multiple shipments. Luckily, our plugin provides an option for creating bulk shipments. The steps to generate a single Order Manifest is also the same, except for the bulk shipment creation process. 1. 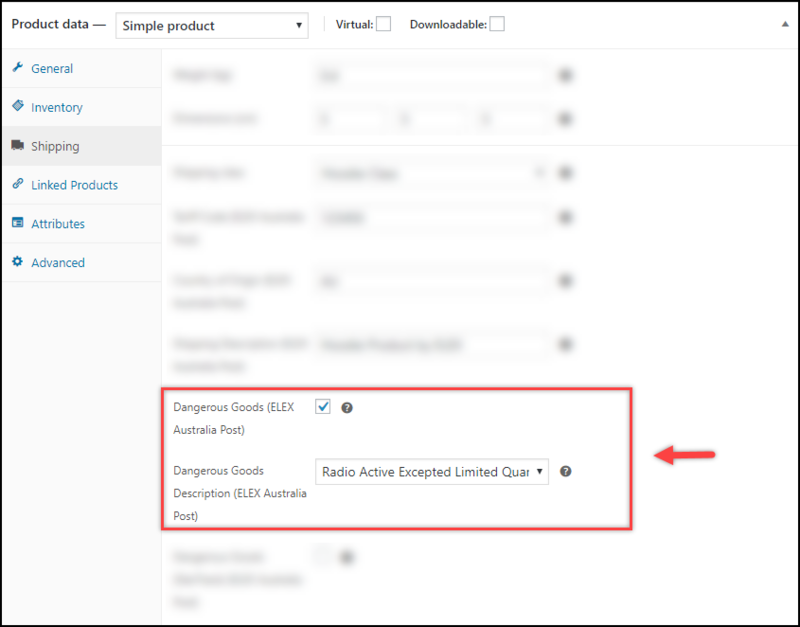 Creating Bulk Shipments for Australia Post– Go to the WooCommerce Orders page and select the orders for bulk shipment creation by ticking the checkbox on the left of each order, as shown in the screenshot below. Next, go to the ‘Bulk Actions’ dropdown list, select Create Australia Post Shipment option, and click Apply, as shown in the below screenshot. Once the shipments are created, a shipment message will be displayed as shown in the screenshot below. 2. Generating Australia Post Shipping Labels – Once the shipments are created, you need to open each order and generate label by clicking on Generate Label button. The settings are as shown in the below screenshot. 3. 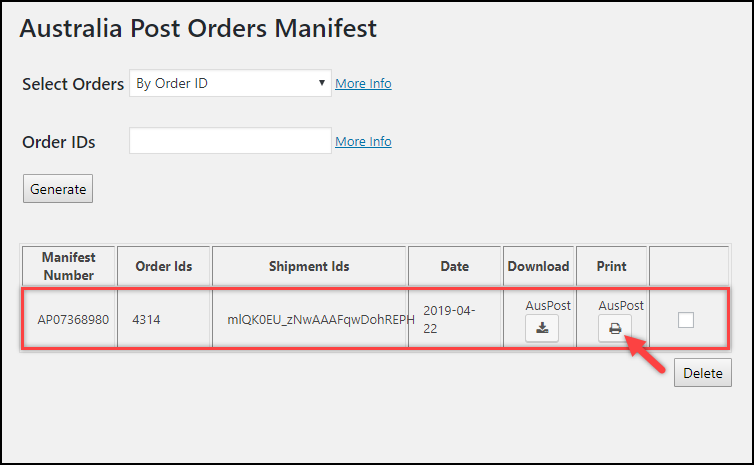 Generating Australia Post Order Manifest – Go to WooCommerce > AusPost Manifest. Order ID – Enter multiple order IDs separated by commas. Date of Label Generation – Choose a date of label generation. The order manifests of all the orders whose shipments are created for the given date are generated. For a demonstration, let us select the first option, i.e, to enter desired Order ID. Once the order is entered, click on the Generate New button. 3. Downloading/Printing Order Manifest – Once the order manifests are generated, the plugin shows a table with contents related to the order manifest. You can see the Manifest Number, Order IDs involved, Shipment IDs, Date of creation of manifest, download & print buttons, as shown in the screenshot below. A sample Australia Post Order Manifest is as shown in the below screenshot. Here’s how you can add tracking information to the back-end of your WooCommerce store. Go to Dashboard > WooCommerce > Orders. Click an order number for which you want to track the shipment. Under AusPost Shipment Tracking section, select the carrier as Australia Post. Enter shipment tracking ID generated while creating the shipment, and date of shipment in the given fields. A sample order page is shown in the screenshot below. Finally, click on Save/Show Tracking Info button. Customers can view the shipment tracking information under the Orders section of their My-Account page. Click on the required order number to view the tracking information. 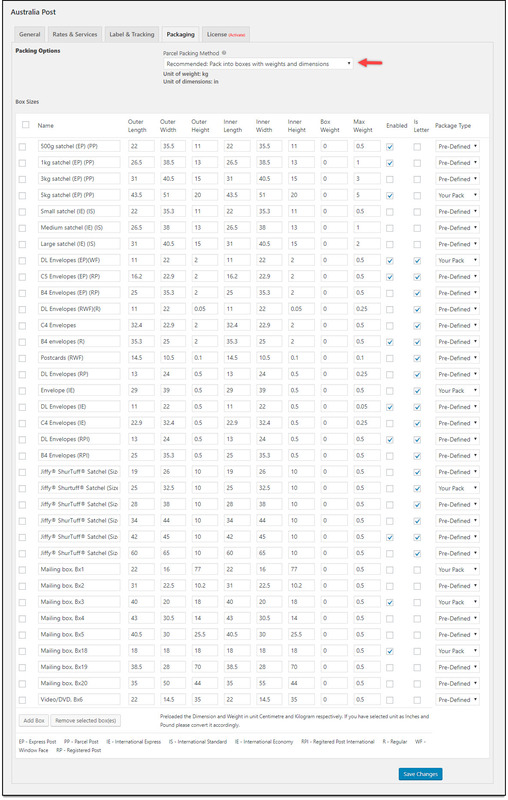 A sample order page is shown in the below screenshot. Customers can click the Shipment ID to see the status of the package. Note: Customers also get shipment tracking information through order completion email. To generate shipping labels in bulk, you would need our ELEX WooCommerce Australia Post Bulk Label Printing Add-On. Once you have purchased this add-on, you can read how to bulk print Australia Post shipping labels to set up the add-on. 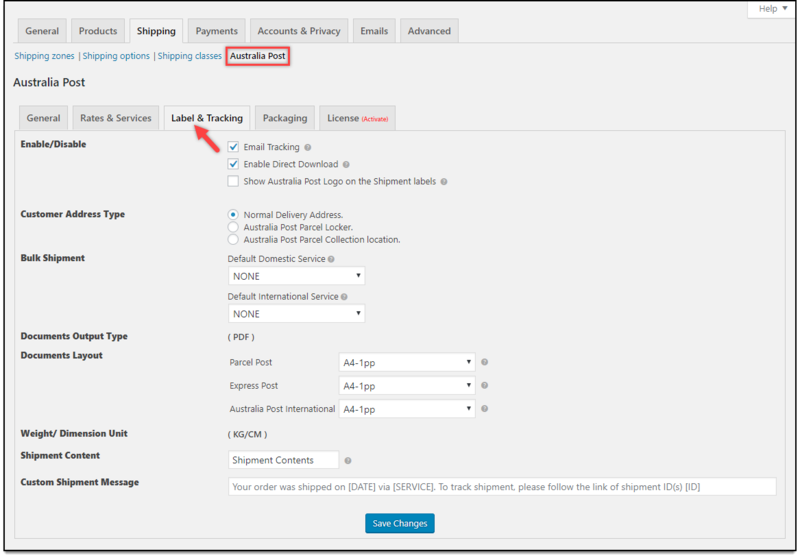 For using this plugin with a StarTrack account, read How to set up ELEX WooCommerce Australia Post Shipping Plugin with StarTrack Account? To explore more details about the plugin, go check out ELEX WooCommerce Australia Post Shipping Plugin with Print Label & Tracking. Or check out the product documentation section for more related articles.